Liczba stron: 84 Jest to ujednolicona liczba stron, która ułatwi Ci porównanie długości książek. Każda strona Legimi to 200 słów. 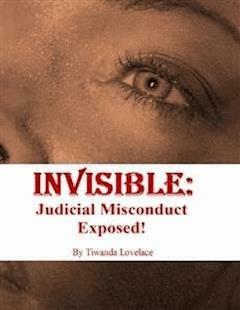 This title discusses judicial misconduct and ‘obstruction of justice’ by court officials and demonstrates how some have been made invisible at the hands of unethical lawyers, the courts and its clerks by a corrupt legal system. See actual, recent proof of corruption, misconduct and injustice. This title includes actual physical evidence and proof of courts and it's clerks disregarding its own court’s rules and procedures by editing, withholding, modifying filings. This book demonstrates how some individuals are deliberately oppressed and denied rights by those that are in positions to manipulate the courts to ensure injustice continues. This title was initiated from actual legal battles involving am Artist/Songwriter's personal experiences with major music publisher. These events are derived from actual copyright infringements, breach of contracts and 'obstruction of justice' events of deliberate deprivation of rights, please visit: https://exercisingmyright.wordpress.com. Review for yourself, the corruption, the scandal and the 'system' which aids in dehumanizing the aspiring artist through willful and deliberate acts and inaction. Imagine people exacting revenge and using their access and resources to block all resolution. Before we delve into the actual court filings and documentation which confirms misconduct, I believe a little background is necessary in order for motives for misconduct can be made clear. Are You Ready to follow this Trail of Corruption! Let's review the Background information. Father convicted of killing a police officer in Detroit, MI in 1967. Mother direct ties and association with Jehovah's Witnesses, a major religious group out of Brooklyn, NY. They promote isolation from non-believers and discouraged college education. Mother hated the father. Mother's true cooperation in betrayal came after her favorite other daughter was assaulted and dropped off at the Kingdom Hall of Jehovah's Witnesses. Subject worked with many Detroit local producers for years and was expected to sign a contract without any monetary compensation, she refused. Although contracted with 50/50 Co-Publishing Agreement with Zomba, a major label out of NY and without any management agreement (verbal or written) and copyrights were secured, she never received any assistance in recovering royalties. Over 40+ Copy-written, musical works stolen and on the radio but she never received any compensation. I obtained copyrights for all works prior to submitting them under 50/50 Co-Publishing Agreement. Representation refused on all fronts. Copyrights were rendered worthless by Corruption, Racism and Sexism! Royalties were Stolen from copyright owner and she was told to go be a Prostitute! She Refused! She Never Received a Dime and No Help in any field for the next 30 years! The use of violence, violence and more violence..! The use of forced, deliberate, continuous hardships which spans across multiple States and multiple industries allows deprivation to continue. Once violence is spread amongst multiple groups as being attributed to specific individuals, no one wants to get involved. One by one family members and 'friends' befall convenient tragedies, incidents and hardships. Without associates, I'm left subjected. Once friends and family are subjected to direct hardships which include violence, your friends and family become few. Then the remaining are usually used to manipulate events in favor of oppressors. While ensuring threats, intimidation and ostracism continues, deals are made to cement oppression. Court Cases where blatant judicial misconduct is proven, are ignored! Another court case filed in different State, courts clerks blatantly deprived rights through judicial misconduct by editing, modifying and withholding plaintiffs filings. Easy to compare each event to demonstrate how corruption is implemented. Trail of violence ignored and covered up by officials illegally modified criminal background and court sealed FBI files. So now, I was forced to being subjected to those who infringed on works AND those in position to deprive rights, while being enslaved, through ostracism. Next housing, employment, business was impeded by illegally obtained warrant and illegal modification of criminal background. When you find employment, there is daily, hourly persecution and harassment referencing past events. Without income, you cannot defend or obtain help because no one will take on these powerful, well-connected entities. Clearly questionable, coincidence of timeline of the court ordered seal of the 357 page FBI File on Lovelace that covered years. This timeline of 'F.B.I. Files Sealed by Court Order' covered the time working with major industry label and local production companies. It also covered the time when mail tampering, violence and intimidation was being exacted. It also covered time-frame when subject was pursuing copyright infringement allegations and court cases were filed. Ne Ne: 'Basically, you can have all the 'laws' in place but 'they' pick and choose not to pursue the legit claims when certain individuals are involved. What I find really disturbing is how events are continuously manipulated to induce bereavement and loss. Through the use of violence, deceit and the use of the public to distract the attention away from true culprits. So not only do you suffer indignities, but you are forced to continued inhumane tactics intended to induce suicide. Officials responses - "We don't see violence..." "This is just a civil issues, get a lawyer..." "We don't represent you, we represent the government..." Summarily..."It's not on our desk...!" Although there are no statutes of limitations on the myriad of civil and criminal allegations being ignored, nothing is addressed. I'm refused legitimate work or when work is obtained, it is followed by public harassment. Regarding the timeliness of this complaint, Plaintiff has suffered continued opposition from many governmental agencies who has ‘under color of law’ taken housing and gainful employment. Plaintiff has been barred from obtaining legal representation due to parties involved. Without stable housing and living conditions, Litigant had been physically unable to compile the necessary supporting documentation (See COM-Pgs. #71). To this day, Def., Dekalb County Police, has refused to correct, update CGIC and forward corrections to CJIS. Recently, records reflect inaccurate information, charges and recently displayed a photo of a black male as being Pltf... (See COM-Pgs. #70). In the blink of an eye and with no hesitation, I was deliberately deprived my opportunity for justice by the Courts Judges, Clerks AND the Def. (as demonstrated in COM pgs. 8-77). The Courts disregard for minority, female plaintiff has led to recent incident where Pltf. was detained, handcuffed, paraded and detained due to inaccuracies maintained on CGIC and CJIS. The behavior of the Court Judges and its Clerks not only condoned the Def. actions prior to the Complaint BUT facilitated the continuation of violation of and deprivation rights…which continues today. Plaintiff has been subject to years of unnatural opposition, persecution that may be due to negative public opinion on lawsuits against state/governmental entities; thus, giving ‘Cart Blanche’ or a license for obstructing justice and deprivation of Rights. I have been denied and absolutely refused any recourse or options, I'm considered an 'idiot,' 'stupid' and 'crazy' because I refused to 'just die' with the truth by committing suicide! When you experience a multitude of unnatural events, combined with deliberate hardships, bullying and deprived of all human and civil rights for a lifetime... you would definitely be negatively affected. That does not mean that you are crazy! Of course, after years of degradation and deprivation, it is difficult for any individual to maintain any semblance of a 'normal' life. They become withdrawn, easily agitated, cautious and isolated. That is, if they don't turn to drugs, alcohol, lose their minds or become suicidal from the constant pressure of bullies. They are, in fact, easy prey for those who have been negatively impacted by this corrupt 'network' or 'system' operating with impunity. I have decided to give some eBooks away for a while and focus on obtaining assistance with restoring my rights as a human being. I hope that others will be able to learn from my experience and recognize how corruption and oppression ruins many lives!. I will continue to write and create beneficial learning products so others may be aware of how the 'system' actually operates. I would like to take a few moments to share my humble opinions on ideas that would be simple remedies to addressing our legal system, the ideas are listed in next section. I would like to take a few moments to share my humble opinions on ideas that would be simple remedies to addressing our legal system. If you would like to review my humble ideas about changing our legal system, please continue reading. It is the American way to seek justice by utilizing the court system. I even mentioned a few cases wherein some litigants were awarded millions for a few hours of humiliation. Personally, decades of deliberate abuse should merit something when that individual has more than proven their case by demonstrating others premeditated intent to harm for revenge. It is clear that financial compensation should definitely be in order when individuals are violated or wronged. I understand that there are a lot of people struggling in the world today because I have lived down here in the trenches my whole life. It appears that there are many college educated people who are still unable to secure full-time employment using their education.